Moholoholo rehabilitates a big variety of animals which have been adversely affected by humans such as poisoning, snares, wild animals that have been pets and so on. The animals are brought to the sanctuary and treated, rehabilitated and then, as far as possible, returned to their natural environment in the wild. There are very limited spaces available for this Project and volunteers must be 18 or older. There is no maximum age limit but volunteers must be physically fit, prepared to work hard and sometimes long hours and be flexible and willing to assist in a complete variety of tasks. Remember, the more you muck in, the more you learn! The priority will be feeding the animals and cleaning their enclosures twice a day. 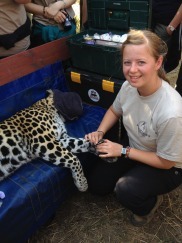 During the rest of the day there are general rehab tasks depending on what animals a re in theCentre. This may include being the surrogate mother to different animals, nursing animals, with sick animals the vet is brought in and students can watch the treatment, collaring animals, re-location of animals and so on. It’s impossible to predict what tasks will be done each day therefore flexibility and willingness of volunteers is a must. When time and weather allows you will be taken on educational walks, game drives and maybe even on a game count on a big 5 game reserve which is part of the Greater Krugr Park near the Rehab Centre. Vet students or those studying animal behaviour/care/management will find this an invaluable experience with different species and there may be occasions for seeing veterinarians at work but please note this is a rehabilitation centre and not a veterinary clinic!! Students will be accommodated in rooms of either 2 or 4 students in separate male and female brick and mortar buildings. There is a dining room/lounge that is used for games, relaxing and chatting to your fellow volunteers. Breakfast at 08h30 is a veritable feast! Lunch is from 13h00 – 14h00 and dinner usually at about 16h45. Excursions such as visiting the Kruger Park, the Silk Farm, Balloon ride and horse-riding are all available and of course at the student’s own cost. The fuel costs are shared between everyone. Students should fly to Johannesburg airport and then take a domestic flight to Hoedspruit airport where they will be collected by Moholoholo staff and transferred to the Centre which is only about 20 – 25 minutes away. They will be transferred to Hoedspruit at the end of their stay for the flight to Johannesburg and further international flight out. There are no set dates and students can arrive on any day EXCEPT Sunday. It is possible to book from 2 weeks for as long as you wish, however, we suggest a minimum of 3 weeks in order to get the maximum benefit as there is so much to experience and learn. Accommodation, 3 meals a day, transfers from and to Hoedspruit airport, 2 Moholoholo t-shirts, 1 Vets and Wildlife t-shirt, support of Project leaders and any course materials whilst on the Project. Flights, medical/travel insurance (please check the links for Insurance information), visas, inoculations, excursions on quiet days, luxury items such as chocolate etc. Please see our costs page for full information.